Select a size Butterfly Chick / Bird Squirrel Hooty Owl Fox 1 Symbol - See Note Mixed - see note Sheep Sea Turtle Swooping Swallow Honey Bee Running Horse Lucky Horseshoe Zuni Bear Dove w/Olive Branch Bumble Bee Heart-which style? 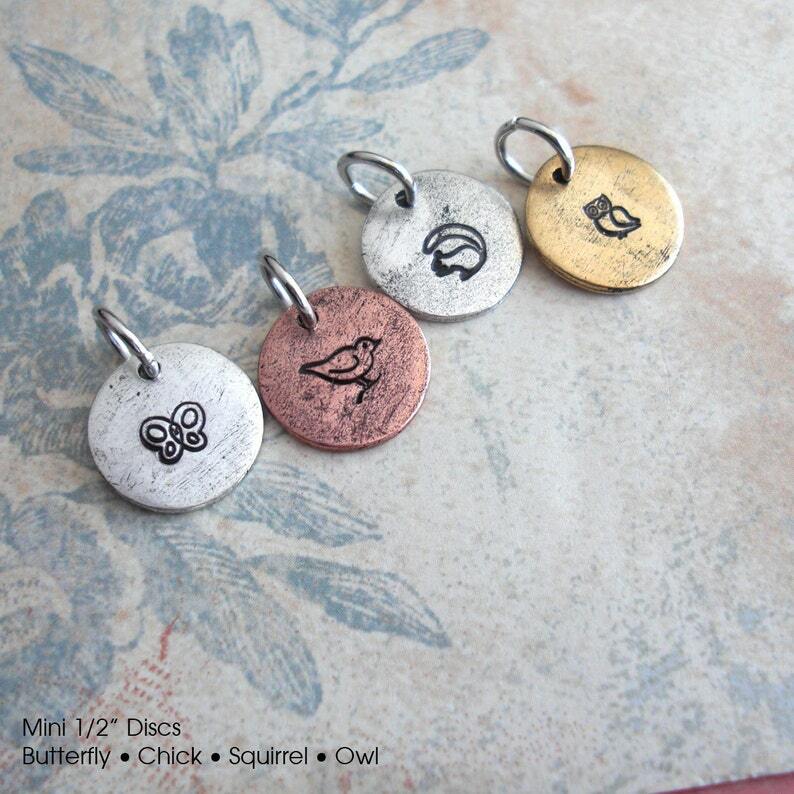 ° One super fun hand-stamped charm. 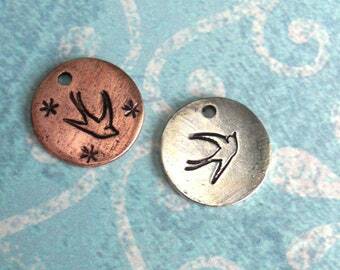 ° Each charm is made to order and will vary a little from the photo. ° Please indicate which metal color you'd like during checkout. • If you'd like more than one just change the QTY once it is added to your cart. 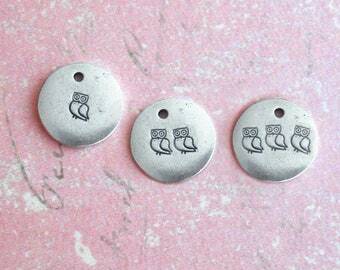 Let me know specific details, which metal and which stamp you'd like for each charm. ° A 7mm jump ring will be attached. 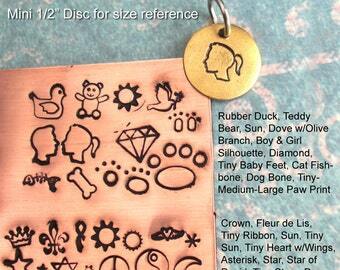 The disc is 1/2" in diameter (13mm). This 1/2" disc is a little smaller than a U.S. dime. ° You can add a bead-ball chain to your order (as shown in one of the photos). Click on "keep shopping" during checkout and add one through the "ADD chain" section. ° All jewelry contains small parts, please wear with care, and be very careful with pets and small children. ° You can order a different symbol, see other photos for options. Leave detailed notes during checkout. 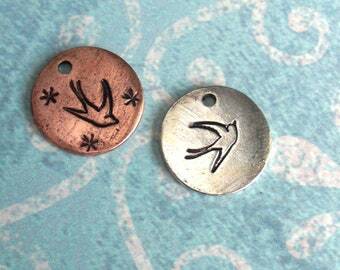 PLEASE NOTE: These are cute and flirty charms, but they may not be stamped in perfect alignment (though I try). Each one is thoroughly unique (like you! ), please allow for slight imperfections. 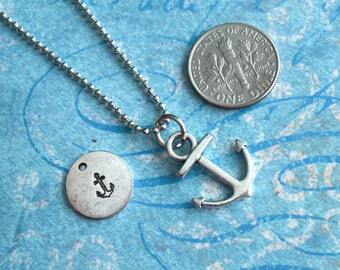 ° Visit my "charms" section to add a clasp, bead-ball chain, crystal or pearl to your order. ° Receive a discount of 10%-20% off when ordering 10-20 or more charms; large orders can take up to two weeks. ° Most orders are completed within a few days and shipped using USPS in the U.S. (estimated shipping times 2-5 business days).